Soak eggplants in hot water for 20 minutes. Drain, then remove stems. Set aside. While eggplants are soaking, heat sunflower oil and 60 ml olive oil in a large pan over medium heat. Add pine nuts and cook for 1 minute or until golden. Add onion and cook for 15 minutes or until softened. Stir in rice and cook for a further 3 minutes or until transparent. Add dolma bahari, sugar, cinnamon, salt and pepper, and cook for 1 minute or until fragrant. Add the warm water, bring to the boil then reduce heat to low. Cover and cook for 15 minutes or until water is absorbed and rice is just cooked. Remove from heat, stir in dill, mint, parsley and cranberries, cover and set aside to cool to room temperature. Season. Spoon rice mixture into eggplants. Stand eggplants, filled-ends facing up, in a single layer in a pan. Add remaining 125 ml olive oil and 250 ml water, and place over medium heat. Bring to the boil, then reduce heat to low and cook for 30 minutes or until eggplants are soft. Remove from heat and stand for 5 minutes. Serve with chopped tomato spooned over. Dried eggplants and dolma bahari are from Turkish food shops. 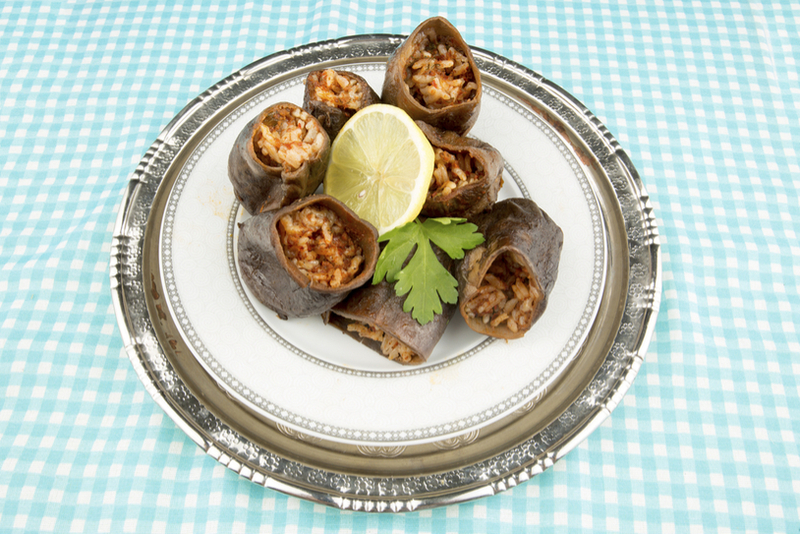 Dolma bahari is a spice mix made specifically for dolma dishes. Substitute 1 tsp sweet paprika and 1 tsp allspice. As seen in Feast magazine, Issue 8, pg94.